It can be a little disconcerting to find oneself the sole customer at a lunch counter at 12:45 p.m. then to realize the person who works there is suggesting that you eat somewhere else. In this case, I was being directed to Ishina’s original location (circa 2003) in Bell’s Corners, where a full hot lunch buffet is served. At this new outpost of the family-run Ishina restaurant and catering company, those seeking “curry in a hurry” have but three choices of ready-to-eat curry combos (read: cafeteria steam-tray fare dished into styrofoam) that change daily. But though I appreciated the advice on where to go for more choice, I decided to stay. This was a craving emergency. There are a few stools with views overlooking the traffic whizzing down Carling, but undoubtedly the no-frills space is primarily dedicated to take-out customers (hint: there are a few parking spots in the back). It’s more a retail shop and packaging space for the company’s popular line of Indian delicacies and prepared meals, which are also sold at food shops and through grocers around town. Ishina also produces a line of jarred sauces — butter chicken, korma, and curry — that can be added to meats and vegetables and turned into meals at home. The day I visited, hot lunch options were malai chicken, aloo mattar paneer, and moong dal. I was sold on the chicken dish when I learned it was “a lot like butter chicken but creamier.” Who knew that was even possible? 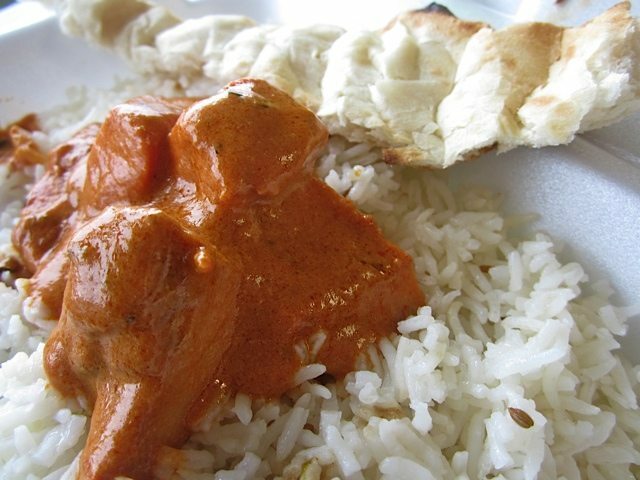 With its seductively rich creamy tomato gravy and telltale mélange of warming Indian spices like cumin, clove, cinnamon, and coriander, I would have been none the wiser if it had been billed as butter chicken. I opted for both basmati rice and naan bread so as not to miss out on a drop of that sauce. Sadly, the naan suffered from being reheated in foil so the fluffy rice had to suffice. Judging by the circles I move in (hungry ones), when the damp, darker, shorter days set in, many of us began hankering for curry. The best I can say is this hits the spot in a pinch, but I’d love to see the Carling shop offer more inspiring grab-and-go options. Dare I suggest the not-so-traditional but oh-so-satisfying curry nann-wrap sandwiches or big steaming bowls of soul-warming chili-spiced soup? And while we’re brainstorming, I’m even hearing about a curry house across the river getting rave reviews for its butter chicken poutine. Hey, whatever works — it’s a long, dark, cold winter ahead. Take-out shop hours: Monday to Friday, 10 a.m. to 7 p.m., (Lunch served only on weekdays); Saturday, 11 a.m. to 5 p.m.
Ishina Distinguished Indian Cuisine, 1808 Carling Ave., 613-695-8282.